Enriched with vast industrial experience, we have been able to offer our clients HIGH SPEED Double Station Blow Moulding Machine. Designed with precision; the given machines are used for making high-quality plastic blow moulded articles and is demanded in various industrial applications. Moreover, customers can avail this highly efficient product at market leading price. 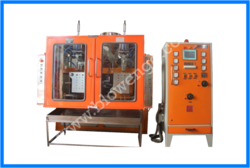 Looking for Double Station Blow Molding Machine ?